Beautiful certificate from the Virginia and Tennessee Railroad Company issued in 1853. This historic document was printed by the Damforth Bald Company and has an ornate border around it with a vignette of a train exiting a tunnel. This item has the signatures of the Company’s President, and Treasurer, and is over 157 years old. 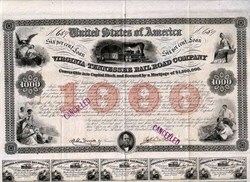 The Virginia and Tennessee Railroad was chartered in 1849. Built in the 1850s, the V&T connected Southwestern Virginia, from Lynchburg to Bristol. With V&T rail lines came expanded economic markets and new industry. During the Civil War, the V&T served as a Confederate lifeline by moving supplies, weapons, and troops. The Confederate reliance on the V&T resulted in the partial destruction of lines by Union forces. In 1870, the V&T joined the Norfolk and Petersburg Railroad and the City Point Railroad to create the Atlantic, Mississippi, and Ohio Railroad. The Atlantic, Mississippi, and Ohio Railroadlater became the Norfolk and Western.